I was recently sent two products by KKCenterHK for review purposes. They’ve also given me a coupon code to share with my readers, simply enter the code polisharmoire and receive 10% off until the end of January, 2014! The products sent were a jar of five 8mm x 3mm gold moustache studs (Lovely Gold Beard N.NAIL Studs – item #NNAIL-DRN740) and a jar of around one hundred 2mm Pink Star Studs (item #NNAL-DRN772). 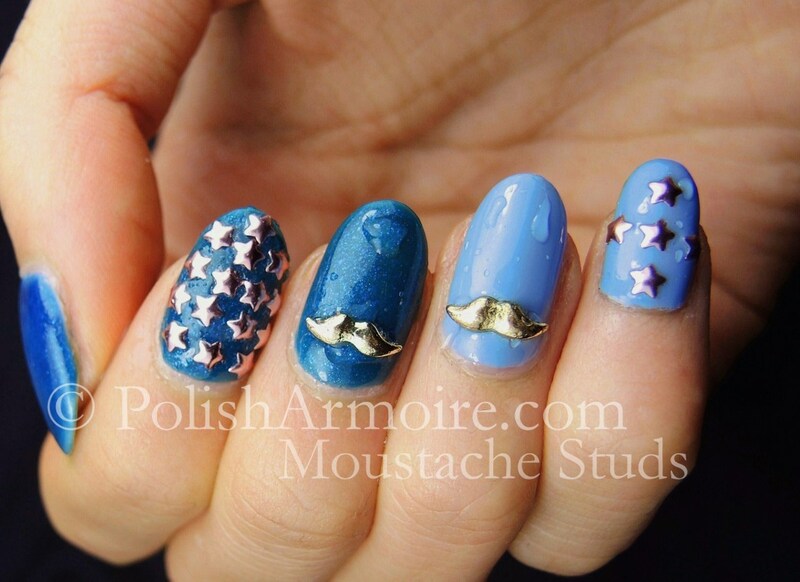 The pink stars were easy to attach while the moustache studs required an extra thick dabbed coat of Poshe to seal in the edges that were raised off the nail. Despite this, the moustache studs stayed on my nails for a good 5 days before finally falling off! On my index and middle fingers I used 5 coats of Lacquer Lust Poseidon’s Envy, a blue thermal colour changing jelly polish with blue/green colour-shifting micro-flakies. Poseidon’s Envy changes from a gorgeous shimmery deep blue sapphire when cold to a green-toned teal blue when warm (as shown below though my camera failed to capture the green tone). I had to use 5 coats because the lighter teal colour it changes to when warm is sheerer than the dark blue it is when cold. Alternatively you can layer 2-3 coats of Poseidon’s Envy over a matching blue which is what I did on my thumb. On my ring and pinky fingers I used Milani Antique, a light blue creme which is opaque in 2-3 coats. 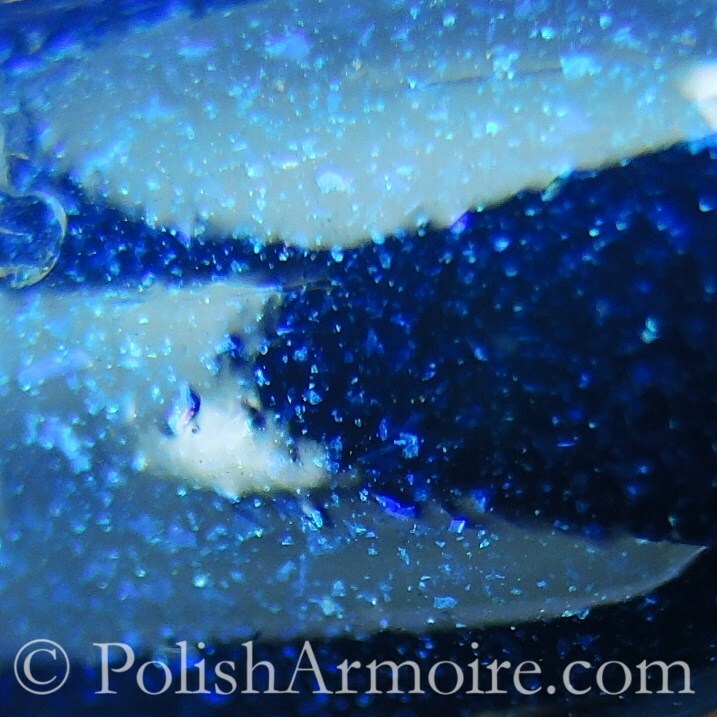 I’ve also included a bonus macro shot of Poseiden’s Envy below so that you can view it in all its micro-flakie glory. 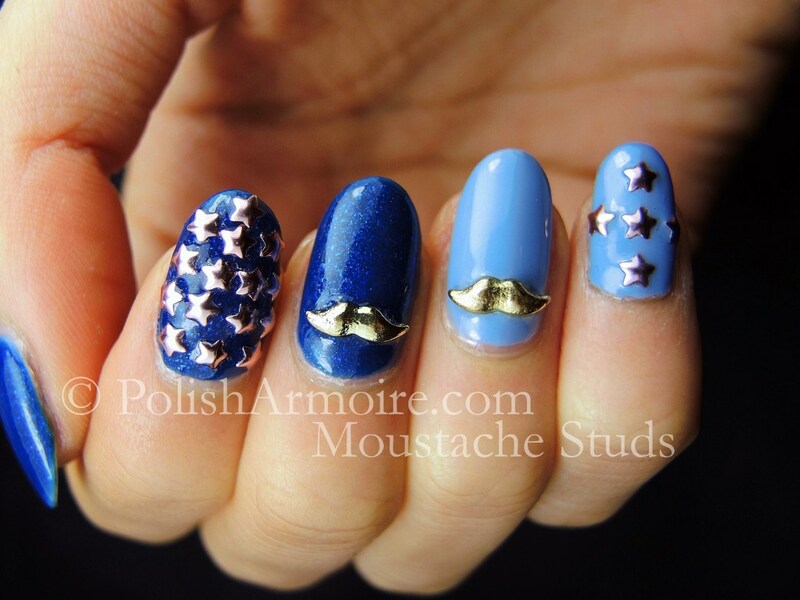 Tags: blue, Colour changing polish, moustache studs, star studs. Bookmark the permalink.